Real Time Stock Quotes for Excel is a powerful Microsoft Excel workbook and Dynamic Link Library (DLL) for stocks and mutual funds. Stock quotes are retrieved direct from Internet without downloading. Real Time Stock Quotes dynamically updates stock market price, change, volume, high/low, etc. from the Internet. Excel provides the framework for managing a portfolio of stocks and mutual funds. The easy to use interface allows the monitoring of prices, changes, volume (and more) with simple '=functions()' entered into cells. Real Time Stock Quotes for Excel combines a powerful custom DLL (Dynamic Link Library) which communicates directly to popular internet stock quote servers to retrieve stock quotes from Internet without having to download separate files and import them. Real Time Stock Quotes for Excel works through corporate firewalls using normal HTTP protocol and ports. An example workbook with spreadsheets shows how to dynamically update market price, change, volume, high/low price, date, and time. Excel calculates gain/loss, portfolio value and more. Spreadsheets are there for mutual fund research and new stock ideas. Links are provided for additional information such as interactive charting, buy/sell opinions, news, message boards, Investor's Business Daily (CANSLIM), Wall Street Journal, Morningstar, Bloomberg and more. Personal links can also be added and modified. The system supports many international exchanges. Many international stock exchanges now supported. Auto quote allows Excel to automatically update prices. Quotes any valid ticker symbols including all NYSE, NASDAQ, most OTC listed stocks and mutual funds. 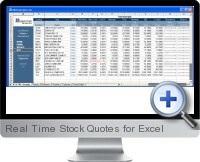 Tight integration with Microsoft Excel allows dynamic updates of stock prices without leaving the workbook. Works through all proxy servers and firewalls. Less than 1 second connect/disconnect time. Quote up to 300 stocks per spreadsheet and multiple spreadsheets per workbook. Easy to use functions extend Microsoft Excel's capabilities. Works with any Internet connection (dialup, DSL, cable modem, T1, ISDN, etc.). Market data: price, change, volume, high, low, date and time. Example workbook contains many other powerful features including Links to useful financial sites. Compatible with Microsoft Excel '95 and higher. No subscription fees for real time quotes. No learning curve: uses familiar Microsoft Excel spreadsheet as a framework. Flexible: you design the system your way. Fast response: no web pages with graphics to download. Only necessary data sent. Causes Excel to crash completely and breaks other add-ins.